Despite Israel's attempts to save Ziad Abu Ein, he was rushed away by Palestinians, who prevented Israel from treating him (the mere fact that they attempted to do so, despite the fact that he has Israeli blood on his hands, speaks volumes). This is a screenshot from the included video from StandWithUs. What happened to Ziad Abu Ein? Who was Ziad Abu Ein? These questions have been asked repeatedly in the past couple days, but I feel that they have been unsatisfactorily answered. Surely he was murdered by Israel, right? That is what Fatah tells us (they would never slander Israel, after all). Despite Israel’s attempts to save Ziad Abu Ein, he was rushed away by Palestinians, who prevented Israel from treating him (the mere fact that they attempted to do so, despite the fact that he has Israeli blood on his hands, speaks volumes). This is a screenshot from the included video from StandWithUs. Actually, no. Not at all (those of you who futilely seek to deny this simple fact can cease reading here and throw your hands up in the air). Despite the BBC’s faulty reporting (excellently taken apart here), the facts make it clear that Ziad’s death is far from Israel’s fault. For some context into the actual events, watch this video of the encounter. Before discussing the events after his death, it is important to go over some facts of Ziad’s life that the media has conveniently decided to completely ignore (in addition to his hiding a terrorist…in his own home). Abu Ein is also on record discussing plans to “dupe” Western governments by making them believe that payments to terrorists have ceased. Another fact that is conveniently left out of the reports is that Abu Ein was previously serving a life sentence (because in “barbaric” Israel, there is no death penalty for even the most brutal terrorists, whereas in many of its neighbors, you can be executed for the “crime” of being gay) for murdering two Israelis. He was released just three years later in the Jibril Agreement (in which Israel released 1,150 prisoners [among them several terrorists serving life sentences] in return for three Israelis). Surely Abu Ein became an advocate for peace after this, right? After all, he did support the Oslo Accords. As for how he died, a joint autopsy concluded that he suffered a heart attack (80% of the blood vessels in his heart were, after all, blocked by plaque). and that an Israeli medic attempted to perform CPR. 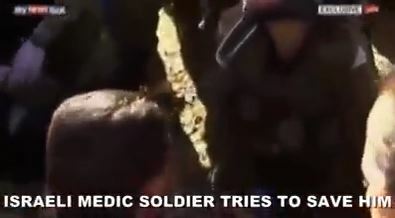 The Palestinians surrounding Abu Ein refused to let the medic treat him, and instead whisked him away (this is according to a British reporter). Despite attempts to portray Israel as the reason for Abu Ein’s death, the facts (including the Palestinian-led pathology report) say otherwise. This is now the second time in less than a month that the PA has falsely accused Israelis of murder, only to be proven wrong. I will conclude with a tweet I posted (I strongly recommend reading the subsequent “debate” where the other person simply refuses to respond to my basic point) on Human Rights Day. If this story, including Israel’s attempts to save a man responsible for murdering Israelis and funding terrorists, proves anything, it is that my words are as true today as they were when I tweeted them.